The strands o0f raw silk as they are unwound from the cocoon consist of the two silk filaments mixed with sericin and other materials. About 75% of the strand is silk and 23% is sericin; the remaining material consists of fat and wax (1.5%) and mineral salts (0.5%). As would be expected in a fiber of animal origin, silk is a protein. The filament itself is the protein fibroin. It is similar in composition to the sericin protein, despite the differences in physical behavior between the two materials. Silk fibroin differs fundamentally from the keratin from which animal hair fibers are made. The fibroin molecule contains only carbon, hydrogen, nitrogen and oxygen. There is no sulphur in it. Silk does not dissolve in water and it withstands the effects of boiling water better than wool. Prolonged boiling tends to cause a loss of strength. Silk will readily absorb certain salts from their solutions in water, aluminium, iron and tin salts. For example, are used for “weighting” silk fabrics in this way. Silk dissolves in solutions of zinc chloride, calcium chloride, alkali thiocynanates and ammoniacal solutions of copper or nickel. Silk fibroin is attacked by oxidizing agents; bleaches such as hydrogen peroxide must be used with care. Hypochlorite bleaches must never be used, as they rapidly tender silk. All the chemical properties of silk fiber have presented in the below with their explanations. 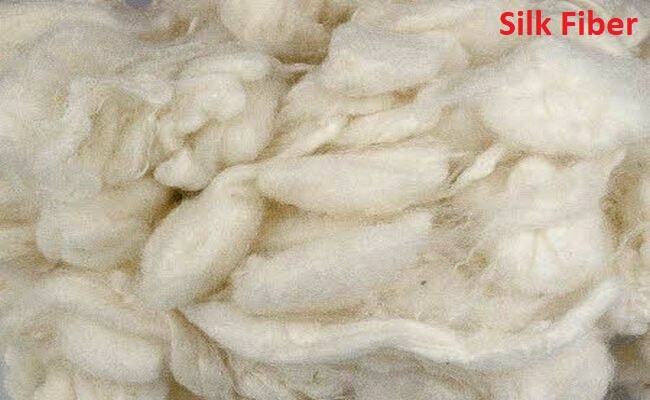 You may also follow the physical properties of silk fiber in textile. Like wool keratin, the fibroin of silk can be decomposed by strong acids into its constituent amino acids. In moderate concentration, acid because a contraction in silk, this shrinkage is used bring about crepe effects in silk fabrics. Dilute acids do not attack silk under mild conditions. Organic acids are used for producing the scroop of silk, which may be due to the surface-hardening of the filaments, and are not easily removed. Silk is less readily damaged by alkali than wool. Tussah silk is particularly resistant. Weak alkalis such as soap, borax and ammonia cause little appreciable damage. More concentrated solutions o caustic alkalis will destroy the luster and cause loss of strength. Silk dissolves in solutions of concentrated caustic alkali. Silk is insoluble in the dry-cleaning solvents in common use. In textile industry, silk is a poor conductor of electricity and tends to acquire a static charge when it is handled. This causes difficulties during manufacture, particularly in a dry atmosphere, but is of value for insulating materials in the electrical trade. Raw silk has a rough handle. It requires its smooth “silky” feel only when the gum has been removed. The particular noise or scroop made by silk when it is crushed is not an inherent properties of the fiber. It is given to the silk by treatment with dilute acids, possibly through a surface-hardening effect. Scroop is not a sign of quality, as is commonly supposed.